Thirty-nine years later, the senior-most member in the 16th Lok Sabha donned the battle gear to help Congress president Rahul Gandhi make huge gains for the opposition in Madhya Pradesh where Shivraj Singh Chouhan is the longest-serving chief minister since 2003. According to available results and leads today night, the Congress accounted for 111 wins and leads in the 230-member state Assembly. The Congress' tally in the outgoing house was only 58. The BJP, which had 165 lawmakers, either won or was leading in 110 seats in a see-saw battle for a majority which is 116. 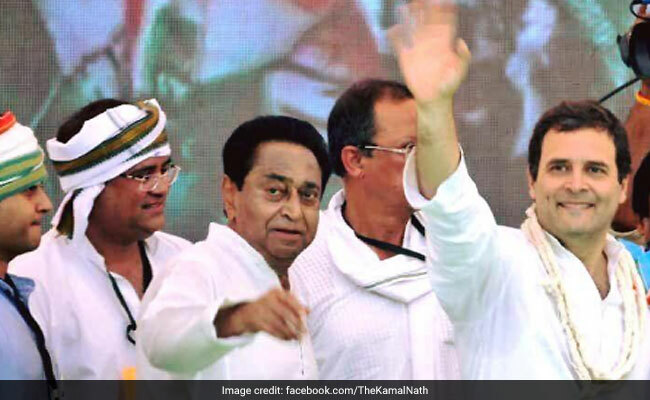 Along with Jyotiraditya Scindia, Mr Nath, 72, was tasked with reviving the fortunes of the opposition Congress in Madhya Pradesh. The BJP attacked Mr Nath after an audio-video clip went viral in which he was heard asking clerics to ensure 90 per cent voting in the state's Muslim-dominated areas to ensure a Congress victory. Mr Nath is a nine-time Lok Sabha legislator from Chhindwara. People in Chindwara refer to the district as an 'oasis' in the dirt. There are also references like 'keechad mein kamal'. Indira Gandhi once introduced Kamal Nath in Chhindwara, saying, "This is my third son. Please vote for him," recalled senior journalist Sunil Shrivastava, who covered that election meeting. When Mr Nath was chosen by Rahul Gandhi as the state Congress chief in April over Jyotiraditya Scindia, the Lok Sabha member from Guna, was riddled with factionalism. Mr Nath made efforts to bring together senior party leaders - former lawmaker chief minister Digvijay Singh, Scindia and Suresh Pachouri - well aware that groupism may have had a role in keeping the party out of power for the last 15 years. The state Congress was able to withdraw most of its rebels from the election arena. As electioneering started and Kamal Nath trained his guns on the BJP, knowing that Mr Chouhan's popularity, built over schemes for every section of society, needed to be countered. Under Nath's leadership, the state Congress focused its campaign on "unfulfilled" promises of Chouhan, whom the party dubbed as "ghoshnaveer" (a man of hollow promises), a term that sparked street debates over the fate of schemes announced by Mr Chouhan.